We do know that the cost to retain a customer is far less than the cost to acquire a new one, but did you know it is much easier to sell to an existing customer than to a prospective one? 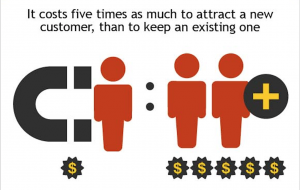 Checkout this great article that finds it costs 5 times more to acquire a new customer. Customer Relationship Management (CRM) is all the buzz lately but most CRM software is very focused on finding new Leads, Sales Pipelines and acquiring new customers. This information is all there in your MYOB Accounting package. Business Intelligence – BI4Cloud is a better tool to help your Sales team to quickly unlock and analyse this data. Sales reps can access this data in the Cloud, without the need to directly access your accounting package or rely on the finance team to run reports. Why not focus marketing campaigns based on products or product groups a customer has previously purchased? Analyse the Sales History and output to Excel for creating an email campaign. If you have complimentary products or replacement products, compare sales history to identify opportunities to cross sell to existing customers. Track sales history weekly, monthly, quarterly or annually by product or product groups. Identify trends to respond to or gaps to fill. BI4Cloud is the key that unlocks the historical data in your MYOB system. Because Bi4Cloud is founded on mobile and cloud technology it is available anywhere at anytime and liberates the valuable information contained in your MYOB data allowing your people to better understand your customer and supplier relationships and be equipped for better outcomes for everyone.